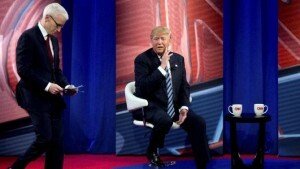 Republican voters were able to see both ends of the ideological spectrum of their party in a town hall present by CNN on Thursday night in Columbia, South Carolina. John Kasich the Ohio Governor, who is appealing to the mainstream vote, started the night with unifying rhetoric as he talked about his record of expanding Medicaid and of lifting the mentally ill and poor. Then it was closed by front-runner Donald Trump who threw barbs at Pope Francis and present and past Republican politicians. In between the two, was Jeb Bush the former Florida governor who appealed to voters from the Palmetto State to keep his sluggish campaign alive. Trump did not make any apologies on Thursday for taking on the most prominent world religious leader the Pope, which dominated the starting minutes of his appearance Thursday. Trump called the Pope a wonderful guy. Pope Francis caused a stir on the presidential campaign trail on Thursday after a visit to Mexico when he said it was not Christian of Mr. Trump to support building a wall to block the immigrants. When Trump was asked about this during the town hall, he said he did not think it was a good thing that the Pope said what he said. He said the U.S. would build a wall and Mexico would pay for the wall. He also said that the Pope had a big wall back home around the Vatican. However, Trump softened his tone when pressed by the host about getting into fights with a number of people but with the Pope as well. Trump said that the Pope was likely influenced by the government of Mexico. He then said he respected the Pope and thought he was doing a good job. Trump also criticized former President George W. Bush for what he called the worst decision every made by a government which started the entire Middle East destabilization when he attacked Iraq.